Exterior lighting is multi-functional. Beyond the safety and security of having a well-lit property, exterior lighting can set the tone for how your home is perceived. There are multiple lighting styles to give your house a unique personality that sets it apart from the rest of the block. This style is very functional. Lights that cast their glow downward illuminate the full property, making this a wise choice for safety-minded homeowners. Clearly define a walking path with small path lights or use high-wattage bulbs in mounted spotlights to use downlighting effectively. For a more dramatic style, direct light from your fixtures upward. This will cast accent shadows on your home. Find places to mount lights near to or on the ground and use a softer bulb to envelope the property in a warmer glow. When you’d rather highlight a specific area, zonal lighting achieves the right effect. This style is designed to cast light on a nearby area rather than distribute light all over the home. 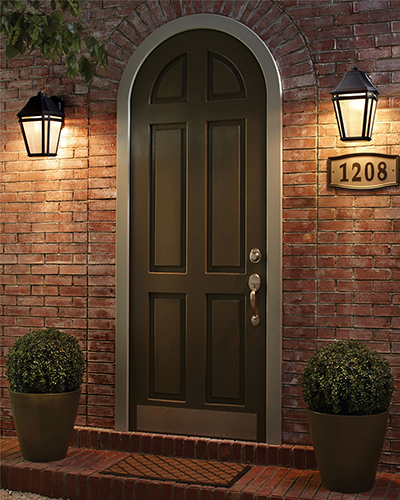 For instance, mount two dramatic sconces to either side of your front door to create an inviting entryway. A more natural and balanced style, moonlighting uses a combination of uplighting and downlighting to create a full-property glow. Lights are often nestled into trees, shrubs, and other inconspicuous areas to obscure the actual fixture, eliminating the feel of artificial lighting. When you’d like to shroud your home in ethereal moonlight, even on cloudy evenings, this style is perfect for you. Hortons is proud to have lighting experts who can help you determine the right exterior lighting style for your home.